When you have to perform the transfer of liquid bulk in the safest possible way we can propose you a range of dry disconnect and break-away couplings. 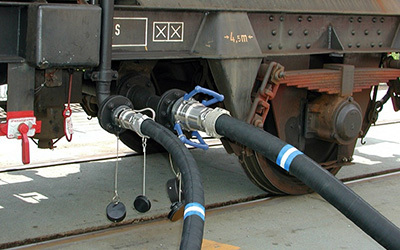 The dry-disconnect couplings are composed of 2 parts: a hose unit and a tank unit. Additionally we can supply the required caps and plugs. Reduces spillages to virtually zero. Dramatically improves both operational and fugitive emission performance. Reduces the possibility of human error in transfer operations. Dry-disconnect couplings offer an unbeatable combination of technical, safety and performance features. Materials: aluminium, brass, stainless steel and materials on demand. Seals: large choice depending on the application. P. Boonen & Co N.V. Copyright 2015 - P. Boonen & Co.